Before I started blogging, I don’t think taking a picture of my food ever crossed my mind. Ok, that’s not entirely true; I remember taking a few food photos while on our honeymoon in Europe…mostly of candy stores and gelato! The more I think about my interest in photography, the more I find it parallels my own personal journey with food. It’s been years now since I recovered from an eating disorder and my love for food has done a complete 180 since then. Food photography is simply another way to communicate my passion for food. I get excited when I see a vibrant dish or taste something incredible. It’s fun to share that through a photo. The amazing (and intimidating) thing about photography is the sheer amount there is to learn. I feel like a kid again, trying desperately to get the hang of riding a bike without training wheels. The challenge is what makes it interesting though and every photograph is the chance to try something different and learn something new. I went from let-me-just-snap-the-damn-photo-so-I-can-write-this-post, to actually enjoying the process. Speaking of trying something new, it’s amazing what a difference background colour can make in a photo. For the photos in today’s post, I used a black piece of Bristol board to place the food on. I picked this up at Michael’s on the weekend figuring I would try out a black background for a change. You can’t go wrong for a prop that costs $1.49! I love the dramatic feeling black provides without overpowering the food like a print or bold colour can. Everything really seems to pop off the black background and the food takes centre stage, as it should. Although most days, the kitchen looks like this.. 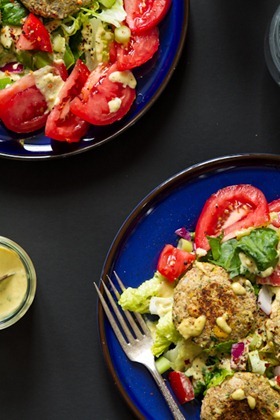 In this skillet picture, black also sets the backdrop for the photo allowing the falafel really pop and the light glisten off the pan. Moral of the story: Don’t give up on creating new hobbies in your life, no matter what your skill level, age, or what you are already doing. Give it a shot. Who knows you might end up finding a new hobby that you will enjoy the rest of your life! So, how ‘bout that food? This recipe today is my spin on traditional falafel. It’s packed with omega rich ground flax and it’s not fried, but you won’t miss it. A bit of lemon juice mixed into the batter really makes the flavours pop. I served it on top of a simple salad drizzled with my favourite Lightened Up Lemon Tahini Dressing, but feel free to stuff it in a doughy pita, wrap, or even make a falafel burger. 1. 1. If cooking chickpeas from scratch soak overnight (or for 8 hours) and then follow these directions for cooking. Alternatively, use 2 & 1/4 cup canned chickpeas. Note: A reader suggests mashing the canned chickpeas (if using) with a potato masher instead of processing them. This will prevent them from forming a paste. 2. In a food processor, with the processor running, drop in 3 garlic cloves to mince. Now add most of the chickpeas (reserving about 1/4 cup to stir in later), and process a few seconds to chop. Now add the onion, lemon juice, and herbs. Process until just combined, being careful not to over-process. You want to leave texture. Preheat a large skillet over medium-high heat. 3. Scoop the mixture into a large bowl. Stir in the ground flax, breadcrumbs, cumin, reserved chickpeas, and salt and pepper to taste. Shape into patties, about 1/4 cup each and really pack the dough in tightly so it holds together. 4. Grease pre-heated skillet with cooking oil and then cook the patties on medium-high heat for about 5 minutes on each side, or until golden. For the salad: Add chopped tomato, red onion, a drizzle of hot sauce, cucumbers, falafel, and my Lightened Up Lemon Tahini Dressing. Have you ever discovered a hobby that seemed to come out of nowhere and now you can’t imagine life without it? Or are you bored with your current hobbies and looking to try something new? Using bristol board is my go-to for a lot of my foodie setups! If you go to the dollar store, you can get 2 boars for $1! HA! 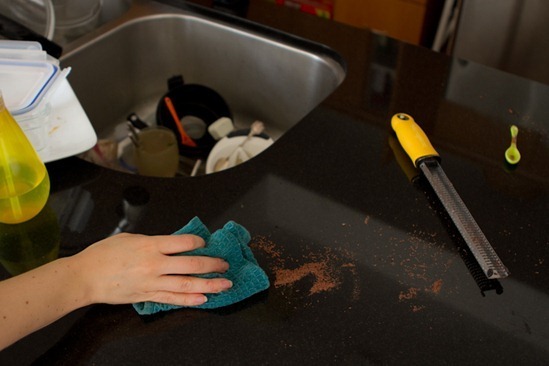 I really like your counter top and can appreciate the easy clean up. Also, happy to hear you’ve dropped your lens in food before. Kevin can’t understand how I manage to get our cameras so dirty… its a challenge! Oh dear… I’m still using my iPhone these days for food pictures… there are amazing apps out there to edit with, but I really need to get moving and use my digital SLR a lot more! Rediscover my passion for photography. Those falafels look incredible! I wasn’t able to plan my meals this week, mostly due to laziness, LOL… this will definitely be on the menu this week! I wish I was more passionate about photography. I think I get too excited about whatever I’m about to eat and am too irked that I have to wait until I take pics to enjoy it. LOL! I’ve been using a Method granite spray on them…works great! My photos are amateur at best but my sister has become really good since purchasing her professional camera. It’s something I’m interested in and I’ve always thought your blog had wonderful photos. My brother tried falafels for the first time in June and loved them. I think I’m going to try this recipe and make it for him :) THANKS! Falafel is one of my favorite foods, but I’ve actually never made it at home. I think I have all the ingredients on hand to try your recipe! Have you bought your lens used or brand new?? I have a Canon T2i and have been wanting to purchase a new lens but not sure if I should go with brand new or used……photography hobby can get so expensive! I bought my lens new…too worried if I bought used I would have issues and not be able to return it. I wonder if you can buy used lenses anywhere with a warranty? Hmmmm just checked Henry’s website and if you buy used from there ebay sight they offer warranty. Which lens have you purchased so far? AMAZON sells all kinds of used lenses with warranties, that can save off few hundred dollars. I always buy new lenses, though, just because I am paranoid about spending so much money and not being happy with used lens. That doesn’t mean that you can’t buy a used lens in perfect condition. I am a big fan of buying my equpment on AMAZON, you can get a small credit line (amazon store card) and usually purchases over $500 have no interest for 12 months. I would like to get into photography more. I also want to learn how to play a musical instrument and learn Spanish. I think those could easily become hobbies- there’s always an opportunity to get better! 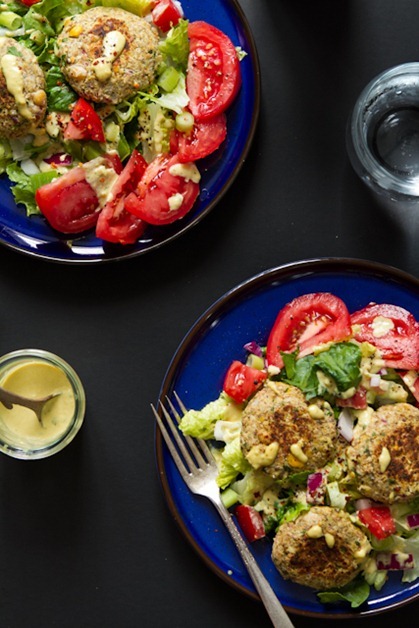 I am totally obsessed with falafel – can’t wait to try this! That falafel is definitely going on the ‘to cook’ list, but I also wanted to add that we tried your veggie burgers again last night . . .. goodness! Just SO delicious! And my husband went back for seconds (several hours in the heat on the golf course requires sustenance). He turned down the hot dogs that his mates were having there, because he knew he was having your veggie burgers when he got home. Plus I have extras for lunch this week. Thanks Ange!! This looks AMAZING. I can’t wait to try it! I love love love love love falafel. Thanks for sharing! I’ve actually never tried falafel before! 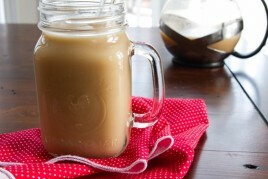 I have all of the ingredients on hand to make this, so I am giving it a try ASAP! Falafels are one of my all-time favorite foods. I love them so much and always get them when I go to Pita Pit. I’m really excited to have your recipe to make them at home! I have a question for you – do you have any veggie burger recipes you would recommend for kids? Sometimes the flavors can be strong and the processed ones have so much sodium. I’m looking for a recipe to try for my little ones. Have a great day, Angela! You might be able to adapt my spicy chickpea burgers (leave out spices & use a mild BBQ sauce)? http://ohsheglows.com/recipage/?recipe_id=6027999 If veggies are an issue, maybe process the mixture so the veggies are more hidden. Would love to see more men commenting! :) Thanks Dennis, I hope you enjoy it. I loved reading your post. And, I can tell, you’ve come a long way, and your passion shows. I almost jumped out of my seat that picture of the falafels in the pan looks amazing! Can’t wait to try it! I love falafel. Photography is also an unexpected hobby for me. I like food photography because you have complete control over what goes in the photo, down to the arrangement and the background color, sort of like painting a picture. And the kitchen mess (my “real” kitchen also frequently looks like yours) stays out! I love that these falafels aren’t deep fried! Your photographs are always so beautiful. Thanks for showing us some “behind the scenes” info and tips! Angela: I went to BlogHer Food about a month ago & went to a great session on food photography. The presenters both have blogs w/ excellent food photography. You can see a recap of their presentation here: http://www.dessertsforbreakfast.com/2012/06/current-food-photography-styles-and.html. I too, have fallen in love with my camera (my husband gets a bit jealous of all the time I spend with it). It’s fun to experiment with backgrounds, aperature, lighting. For myself, I won’t take pictures of food unless it’s in natural lighting. I just can’t bear the sight of my food under the flash, but that’s just me :). Thank you for the link! I will def. check it out. I agree about natural light…it’s easily one of the best ways to improve a photo. No problem, I always appreciate learning from people who really know their stuff. I’m glad they were so kind to share their expertise. Yes, natural light is an amazing thing. No replacement for it. These look great! Quick questions – did you use fresh herbs or already dried? I used fresh herbs…I’ll clarify in the recipe! i love photography too and wish i took more time (and space!) to really get a great collection of props…it’s amazing how you can take something from good to great with perfect lighting and props! I had much the same process, discovering food photography. I was interested in photography prior to food blogging, but hadn’t really taken food pictures before. It’s a completely different from other kinds of photography, and there is so much to learn! I think the key is to never stop playing. Also, those falafels have me lickin’ my chops – I haven’t had middle eastern food in a while, and my belly is saying it’s about time!! Well, definitely my blog ~ the writing, the recipe creation and the photography have all become a passion of mine over the past 18 months. It’s a great creative outlet and I find so much fulfillment and joy out of doing it — more than I ever imagined really! I also just started weight training as part of my exercise plan. I was scared to death to start it and really, really intimidated and now I can’t believe how much I love it! I actually make a workout plan each week and look forward to every single workout! GEOCACHING….. a group of our friends have recently discovered it…been going it since April 2012 and have already found over 160 in my area of the city where I live…. 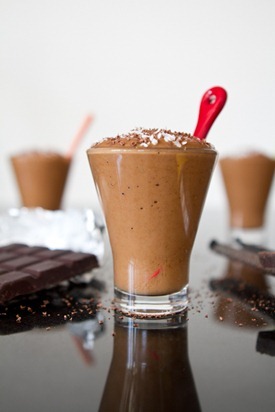 if you are worried about them falling apart… put the blended mix in the fridge for 2 hours! yes, I’ve seen those recipes too…should try that method sometime! As a vegetarian, avid cook, & foodie, i have made falafel a dozen times. I have found through trial & error that the key is to use falafel that have NOT ever been boiled. 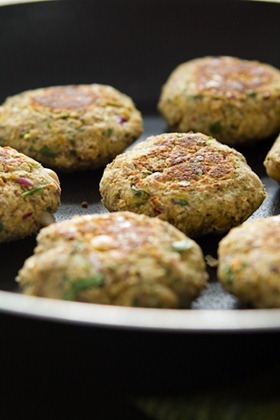 The texture and flavor of falafel made with canned or boiled chicpeas is too mushy and the mixture doesn’t hold together, making it necessary to add unusual falafel ingredients such as flour, breadcrumbs and eggs. Give it a try using soaked chicpeas and blending them… this will give you a great crunchy falafel that holds together, is soft in the middle, and has a perfect nutty flavor! I like this idea, but that would mean longer cooking time for the raw chickpeas, correct? I can really relate to this post. As a new blogger, I want my photos to be beautiful and captivating and interesting, but at the same time – especially with cooking – it’s like, uhg I just want to get this over with! I know I need to purchase a new camera and learn about photography more and it is definitely intimidating, but the prospect of actually being good at it and being able to learn a new skill that can be used in many ways (not just blogging) is very exciting! 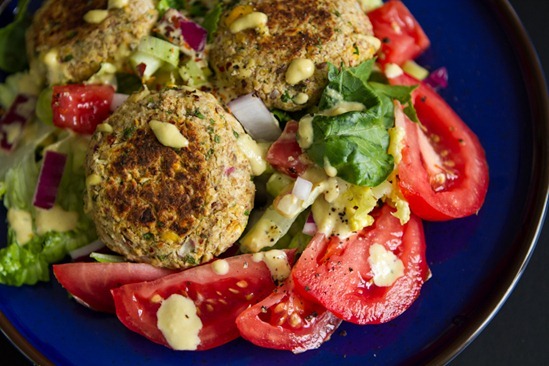 This falafel recipe looks scrumptious! The man and I are trying to go on a diet and this is the perfect alternative to the traditional version! Thanks for sharing! The tomato looks sooo good in the pictures! YUM! Your falafels are making my mouth water and it’s only 8:00 in the morning. I’m definitely going to make this recipe. Do you ever end up with a weird fishy taste when cooking with ground flax? I typically use ground flax stirred into oatmeal or smoothies but lately, when I add it to something that has to be cooked I get this off putting fishy taste. I dont remember ever having that problem with ground flax before. Hey Tonya, I haven’t noticed any strange taste when cooking with flax. Maybe the flax has spoiled? I don’t know perhaps….I buy so much flax maybe that was an older baggie-ful. However, someone gave me some Trader Joes Roasted Flax Seed once because they didn’t like the taste and when I tasted it I discovered why–fishy! Maybe you can try using ground chia? I find it has a lighter flavour. It absorbs more water though so I usually scale it back if subbing by at least half. Ok I will try ground chia. Thank you for your help. I JUST got my first dSLR and am having so much fun learning about all of its amazing features; there are tons of things to think about! I’m amazed that you feel like you are learning so much because I feel like I have been reading your blogs forever and have admired your photography for so long-can’t wait until I am taking pictures half as beautiful as yours! Like you, I can’t imagine my life right now without my passion for photography. I’m sure if my life took a different route I’d be into something else, but photography fascinates me right now. I’ve also been playing with black back drops and bit more dramatic photos.. it’s fun to change up and develop your style as you go.. no rules! I love your photography … definitely admire it! And this recipe looks to. die. for. Yum! I am also getting into food photography (and photography in general) and I love it! I have so much fun playing with backgrounds and props but I need to make sure I have a good 3-4 hours of free time so I don’t have to rush the process. I would love to see more photography tips, tricks and how to posts on your site because you pictures always look great! I have a couple paper backdrops and I love them because they are so cheap but I always end up spilling on them! I feel you…my boards are all stained. I have one white board made from plexiglass though and it’s so nice because I can wipe it clean. That is a great idea to use plexiglass! Where did you find white plexiglass? I use a thick white Bristol board to bounce my light and it has fallen into my food so many times it is covered in stains and I can’t use it as a backdrop or base anymore! I get bored really easily so I really need to add new hobbies all the time. I’m working on learning more about photography. I got a DSLR for my birthday this year, but so far it’s been a slow process of taking it off auto. I always appreciate your posts about photography – they’re inspiring! 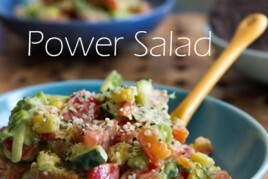 I have always wanted to try making these raw using soaked and sprouted garbanzos!! I would not want to clean up your kitchen though!! LOL. The falafel looks great, but, um what is that chocolate deliciousness on the countertop?! Did I miss where you said? I hate to admit this, but I have not tried falafel. It’s a shame because cumin is one of my all-time fav spices, and I can’t get enough chickpeas. Definitely bookmarking this! The falafel looks great. And I love the photos of food with the black background! Beautiful pictures! I have had a huge passion for working out in general for the last 8 years, but I always thought, as a female, that I was suppose to do cardio all the time – running, cycling, elliptical. I came to find that I didn’t enjoy these activities nearly as much as lifting weights. Strength training has turned into a hobby of mine, and I’ve loved the changes it’s made to my body. I always try to encourage other women to give strength training a try, because you never know, you may end up enjoying it more than your cardio of choice! Yum I looove falafel! In DC, there’s a place called Amsterdam Falafel shop that has some pretty amazing falafel. 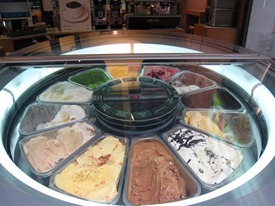 They also have an unlimited toppings bar!! Loving the new blog header- and the falafels wow! I’m so glad I’m not the only whose kitchen looks like that! Haha! You’re falafels look delicious, they are definitely going on my menu next week! Your photography is amazing and I am totally intimidated at the thought of trying to learn to be that good. I can totally appreciate though how it’s just another way to share your passion for food. A friend and I made a gorgeous beet and rhubarb salad this past weekend after visiting the local Farmer’s market and I so wanted to take a beautiful picture to share. These look awesome, Angela. And, I’ve been meaning to thank you big time for that spicy chickpea recipe. I make vegan burgers all the time, but can never replicate the results perfectly – it’s always a gamble as to whether the texture will be just right. As you said, they are so tricky to get right. But, armed with your characteristically super detailed instructions they came out beautifully and tasted fantastic! And, I’ve made them three times since you posted the recipe…my new favorite burger recipe!!! That’s awesome Karen, so happy you enjoy them! I am wondering if there is a sub you could recommend for nutritional yeast in the Tahini Dressing? Thanks – I’m a regular follower and love your blog. Thanks so much for the healthy and fun recipes. You can feel how passionate you are about photography through your words, it’s wonderful! It’s not really a hobby, but a passion of mine now is being vegan. I love researching foods, articles, clothing ect and everyday question how I ever lived another way. It’s so amazing to look at your older posts and see the progress you have made with your photography. It’s obvious that photography is a growing passion of yours and we are all so lucky to benefit from the drool inspiring photos! This looks delicious! I love falafel so much, but never want to order it or make it, because it’s traditionally fried in all that oil. This is such a great option – all the flavors, none of the deep frying. Can’t wait to try it!! THANKS! I was thinking before I started reading your blog today how amazing your photography has become. Keep going with it, it’s brilliant. I made falafel not too long ago and it was a huge hit! Your recipe sounds delish and I’ve already made the Lightened Up tahini Dressing and can only imagine the magic that happens between the two of them! Thanks! those falafel look delish! I have chickpeas soaking, originally intended for hummus, but I may have to make these instead! Great post and I think you reached many people who ever may feel frustrated to never give up! job well done. :-) I look forward to entering the world of photography soon… my newest hobby is surfing, it is still so challenging it scares the beep out of me! Mmm, these look so good and the pictures are stunning as always! oh my gosh I LOVE this recipe! i am such a fan of falafel! this looks so delicious! Wow, I think it’s fate that I came across this post today, and not just because I love falafel! I started blogging less than two months ago, and just wrote a post about starting this new hobby that I enjoy very much, despite being overwhelming sometimes. Your post was a reminder to keep cracking at it and enjoy the learning process! Thanks! I’m glad you enjoyed it…I’m off to check out your blog! These look so good!! Your passion for photography should come with a disclaimer that says: caution, pictures of food may induce drooling. After I took a creative writing class, I changed my major to become a creative writing major. Can’t imagine life without writing, and my blog is a big part of that! Blogging seems to be my new hobby obsession, but I’m hoping to get more into photography one day when I have more time and money. I love falafel, but I have never made it sucessfully. I will have to give this recipe a try! I’ve tried to make falafel twice fro scratch and it was a bust :(. I’m going to give this recipe a try next week so cross your fingers for me! I FINALLY bought a Vitamix a few days ago w you as my inspiration. I’ve been visiting your site for a couple of years and found inspiration in your green smoothie recipes. The Ontario tomatoes are looking pretty good this year! Totally agree…I bring my point and shoot everywhere! Just wondering – Have you tried it with the canned chickpeas?? Have you expereinced this at all? And if so what were your solutions? Hey Sarah, I haven’t tried it with canned chickpeas, but thanks for the tip! I assumed it would be fine. I like your suggestion of using a potato masher, I will put that in the recipe as a suggestion. Oh, falafel! My favourite. I’m always collecting falafel recipes to try and find the perfect mix, I’ll definitely be trying this when I can. I feel like my hobbies haven’t changed much over the past few years… cooking, running, hiking, and reading have always been interests of mine! Hi Angela, I LOVE your blog so much, it’s my homepage on my computer! 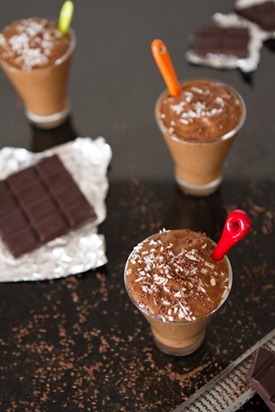 What is the delicious looking chocolate drink in these photos? I tried these last night and they were amazing with the lemon tanini sauce! Except they turned out too wet, so I had to bake them for 20 minutes or so. Maybe because I didn’t have bread crumbs (or bread to make it), so I used ground almond. Still great! I’ve had a ton of success with all of your recipes, so much that my omni boss wanted the “best veggie burger” recipe I make all the time. This is my first comment, but I’ve been following your blog for awhile. I’ve made a bunch of your recipes and everything is to die for! I’m (very) slowly making the transition to vegan, so your website has been so helpful. Hey Courtney, Thank you so much for your kind words. I’m so happy you enjoy the blog & recipes! I love your pictures and I wish I had time to make photography one of my hobbies, but I can barely snap a picture or two without the kids begging to eat what I’m photographing. I can’t wait to try your falafel and I love your real kitchen because that is the way ours looks pretty much all the time except right after I’ve cleaned it. Sigh. A busy kitchen is a happy home. The passion that you have is easily seen in the pictures – they are amazing. I have found that the more pictures I take of food, the more I love it. I am currently looking into a SLR camera and cannot wait to make the decision and go ahead with it. Beautiful photos, this recipe looks great! great photo’s. I’ve followed your blog for a while now and you have progressed so much! What camera & lens do you use? I love this! I was totally wanting to make falafel this past weekend (or buy it) and had no idea how or where to find it :) This is perfect. 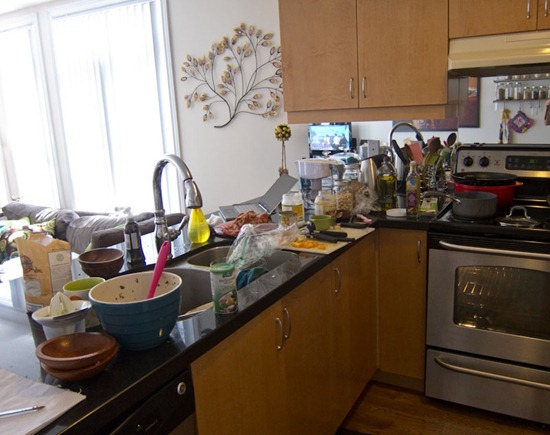 I love how you shared the pic of your messy kitchen too. It’s good to know I”m not the only one!! The black bristol board made a beautiful photo. When do you think the best time of day to take food photos is? I know for sure it’s not 7:!5PM when I’m scrambling to get dinner on the table… but I’m going to have more time on my hands soon – transitioning to stay home with my toddler at the end of the month, and I’ll have more flexibility on when I can take pics. Would love to hear from you! PS. And I’m trying to cook more vegetarian/vegan meals now that my hubby has suuuuuuuuper high cholesterol, so I’m loving your blog and all the wonderful recipes!! Hey Kelly, That’s a great question and one I’m still figuring out! I find it varies for me, but I usually have the best luck late morning and late afternoon/early evening (between 4:30-6pm). During mid-day the light comes from above (rather from lower down like morning and later in the day) so it can be a bit difficult. With that being said, if I’m making a recipe and the light conditions aren’t great, I just work with it. In a pinch, I will shoot a recipe just after sunset or early in the morning if that’s how it works out. If you find it’s dark when you are trying to take pictures, you could consider buying a photography light to help brighten things up. I’m considering this for the winter when I will be shooting lots of cookbook photos and the sun will be setting early. Goodluck with your blog, I’m going to check it out! 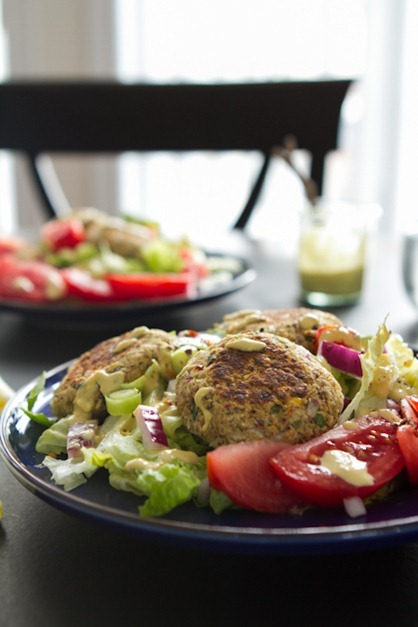 Falafel is a staple in my kitchen – we all lo-o-ove it! About photography – you just described exectly what is happening in my life too since I started to blog. In addition, as I blog ocationally about garden, I’m getting into picturing insects – it’s fascinating – whatever your eye naturally can’t see, your macro shots catch! I would love to be able to snap insects some day! Some of the pictures I’ve see online are unreal. Angela , I love your blogs. I just wanted to let you know that as soon as this was in my email knew what I would be making for dinner. They were AMAZING!!! Thank you so much for sharing your wonderful recipies and I look forward to more. Hey Amanda, I’m so happy you enjoyed the falafel! Thanks for letting me know. Hey Cortney, I’m so happy to hear that you both enjoyed it. Thanks for letting me know and taking the time to comment! Thank you Jen! I have a long way to go, but that is half the fun. What I love most is seeing progress. It’s not about being the best photographer, but learning & trying new things. Thats why I enjoy it! Angela! I made your falafels last night. YUM. Thank you for the recipe. I am sharing my food at work today. Your tahini dressing is always so good – I use it on practically everything. My friend and I made this tonight…they were DELICIOUS!! We also baked our own pita bread to go with it….divine. I am definitely making these again SOON! So, as usual I impatiently tried this recipe even though I only had half of the ingredients. I substituted Orange Muscat Champagne Vinegar (Trader Joe’s) for the lemon juice, added extra cumin, and raisins and omitted the fresh herbs, flax and breadcrumbs (didn’t have these on hand). It was still delicious! Mmm mm. We served them tossed with arugula, tomatoes, cucumbers, raisins and a simple vinaigrette (olive oil & more of that orange vinegar). Thanks Angela! Glad it turned out for you Brittany! Don’t you love when recipes adapt well? Wow these look really good! Do you think I could substitute ground oats and eggs for the breadcrumbs? This receipe sounds great! Though I wanted to know if you had a suggestion on what I could substitute for the bread crumbs to make this a gluten free meal. My interest in photography began in high school, and I fell hard for food photography when I started my blog a couple of years ago. It’s so fun to look back in archives and see how my photography has improved over time! And you’re right, black backgrounds are awesome. This falafel looks great, too! I made this the other night and it was incredible! Falafels are new to me, but once I tried them I have thought about them and have had cravings too often. This recipe was awesome and so much more healthy than deep frying without losing any of the wonderful flavor. I loved the salad spin and the dressing was perfect. Thanks! Hi, I love falafel and I decided to make this this morning. It tasted amazing but the only problem I had was it seemed too wet and wouldn’t stick together. Any idea why? I used olive oil to grease the pan and had the falafel mixture in the fridge for a couple days before I decided to make the patties. Have you ever considered a baked falafel? 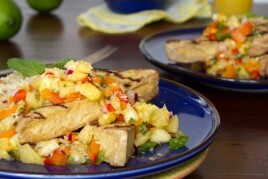 I find to many vegan/vegetarian recipes are high fat/high calorie and I do not eat that way. What tempature would you recommend baking these at and for how long? My hobby is actually the same! From the passion for food and for photography, I created my own blog (in Portuguese). Still far from awesome as yours is, but I’ll get there! Congrats! I doubled the recipe, and it’ll just be too many falafel balls for us to consume in one week. Can they be frozen? Cooked or uncooked? Any suggestions for how to wrap and freeze would be great! LOVE your blog. Thank you for all your recipes! Hey Marti, I would probably cook them in the oven first. Cool completely and then wrap with tin foil. To reheat, pop into the oven still in the tin foil. A reader gave me this suggestion and says its super easy. Enjoy! 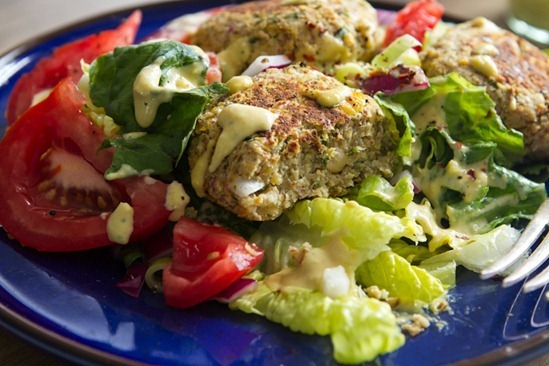 Amazing looking recipe, I adore falafel and the lemon in the batter seems a great addition! Love that they are not fried. I am also a recovered anorexic and though it’s been years since I put on healthy weight (and then some) it wasn’t until I became vegan that I really found a passion for food. Thank you for sharing, I also share your passion for photography, you now make me want to photograph foods! Just made this felafel.. this is going to change my life. Also a huge fan of your veggie burgers – so much better (and cheaper) than store bought ones. Love knowing exactly what goes in them and making them in bulk and freezing them. You sold me at green monster and are now three for three. Pumped I found this website – I feel a little less alone!! I fellow blogger directed me to this site because I was in search of a lower fat falafel. I am very excited to try these! I too, recovered from an eating disorder (bulimia) years ago and I find it fascinating (though not surprising I guess) that my love affair with food has turned into a passion for cooking and trying new, healthy recipes. I am so happy I was able to take up cooking and actually enjoy it after so many years fighting with food. Congratulations on winning your battle and for everything that has come out of it! I need to expand my photography skills. Better yet just learn to use my camera on shooting food and anything really. I love photography! This recipe looks delish I can’t wait to try it. Hi Angela.. love love love your site.. beautiful photography, yummy food, funny commentary.. awesomeness! I have a question about the falafel (if it was already asked and answered, I apologize)… can you substitute chick pea flour for the mashed peas? Thank you Donna, About your question, Im sorry but im not sure! No problem… I will give it a try and let you know! I am trying your falafel recipe but I can’t find your “Lightened Up Tahini Dressing” ??? Can you help me. thanks. I tried this falafel and it fell apart in the pan, so I baked rest of the patties in the toaster oven and they came out perfectly. I love the lemony flavor. Thanks! Just made this tonight and it was wonderful! I’ve made falafel a few tines from other recipes, and this was by far the healthiest and easiest version. With the tahini dressing, it was the Yummiest, too. Thanks for giving us so many recipes that are easy and fun to make, delicious, and totally embrace the whole point of being vegan. Your website is always my first stop for a healthy and tasty meal! My sister introduced me to your blog and I love it! I made your cozy millet bowls last weekend and tonight tried these falafels. The taste was great but my totally crumbled. I packed them as tight as I could. I’m guessing it had to do with the bread crumbs. I’ll have to try again! 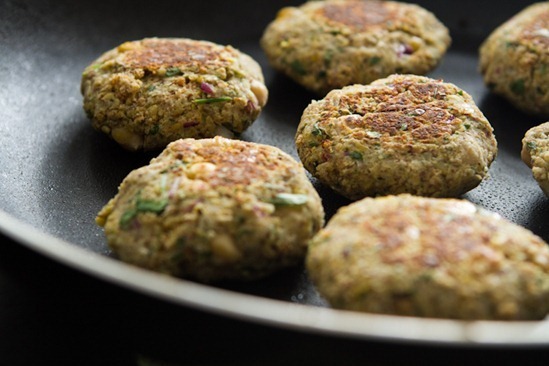 Do you think I could make these falafel patties a day in advance, and they would keep ok in the fridge and then just cook them the next day? Hi Karen, I haven’t tried it myself, but I can’t see why that wouldn’t be ok. Your Falafel look delicious! I just realized I ran out of flax – I was thinking about using another 1/4 cup bread crumbs as a replacement or do you have any other suggestions? Are the flaxseeds just for flavor / omega purposes or do they have thickening purpose in your recipe? I used canned chickpeas and the patties would not stay together. Any ideas why this would happen? I followed the recipe exactly and was careful not to overprocess (I thought). They were still insanely delicious! But I would like to figure out what I’m doing wrong. Thanks! I rarely leave comments on websites, but I wanted to thank you. This is one of the best Falafel recipes I have ever tried. Thank you! These were amazing! My kids (ages 2, 6, 8) loved them!! I waited a while to do this because I didn’t want to spend the time on something they wouldn’t eat, but I figured they may like the crunchy outside — and that was their favorite part! I used garlic powder instead of fresh garlic (simply because I didn’t have any), and I used Trader Joe’s Gluten Free Flour instead of breadcrumbs. I used my melon baller to drop them into the oil, and they cooked a few minutes on each side. Delicious, thank you! 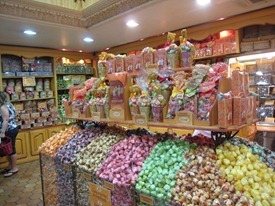 Too bad there weren’t any left for me and my husband! Next time I’ll need to double the batch. My daughter and I made the falafel last night – it was fantastic! Your photos are gorgeous and your recipes very easy to follow. made this tonight! So good, especially with the tahini lemon dressing! I just cooked this for a Vegan Pot luck (My first vegan event) and It was amazing. I followed the steps carefully and even got a seal of approval from a Turkish guy! Thank you very much, Very impressed. slightly obsessed with your blog. have you tried pre making these and freezing them? thanks! Hi Hannah, So glad to hear that you are enjoying the blog so much! Wanted to make these for a LONG time and finally got to it today. I found the patties fell apart easily for me, so next time I would add an egg or two. Also, I would up the herb and cumin as I felt they were a little too bland for me. But this is a good basic recipe to adapt to individual tastes! Thanks Angela!! Most of the comments on here are about photography. BTW, am looking forward to making these and will take one of the reviewer’s suggestion to place in fridge for a couple of hours. These look great! Have you ever tried baking these in the oven instead of pan frying? can you use a blender instead of a food processor? I absolutely love this recipe! Every time I cook a meal from Oh She Glows I wonder how in the world it will work, they just seem too healthy, with not enough wet ingredients to bring them together. But I am always amazed becuase they are delicious and the best recipes I have come across. Can’t wait to get the recipe book! Do these reheat well, or would you recommend refrigerating the leftover patties uncooked and then cooking them when we’re ready to eat them? These went really wrong for me. Can anyone tell me what I did wrong? The outside burned off onto the pan despite tons of oil and the rest was so wet that they didn’t hold together well. I modified the ingredients to use gluten free bread crumbs – so maybe that was the problem – perhaps the “bread” crumbs didn’t absorb enough of the liquid? I made these last night with my Mom, salad and all (didn’t have tahini so just used a dressing we had at home). They were really delicious with some taziki i got with all natural ingredients, and I also made some gluten free bread with olive oil and spices on the side. I wanted to add that I didn’t use a food processor, just a potato masher which left some full chickpeas but i liked the texture change. These were AWESOME as my lunch the next day, cold with taziki on top and the rest of the salad on the side. YUM!!! Can you freeze the mixture before cooking? We made way too much and I figure it will only be good cooked and put in the fridge for a few days. Thanks! OMG This was so freakin’ good, I am glad I tried it. I can’t even explain the taste but it was… Heaven!!! Thank you. Hey There! I may wind up attempting this during a snow day, but just in case that I can’t get to the store, I do have Bob’s Red Mill chickpea flour. Would that still work? These look awesome! Do they freeze well? It’s vegan week in our household which means I am trying out new recipes daily. While I primarily eat a plant-based diet, my husband was raised on meat and potatoes. And while he’s progressive and willing to try my concoctions, he still needs his meat. That said, tonight I made the Falafel with A Twist and served it with a green salad topped with avocado and your roasted chickpeas along with the Lightened a Up Lemon Tahini Dressing. Bill declared the meal “awesome” and said “we should have this once a week.” He rated dinner a 98 out of 100 and said he didn’t have a reason for docking two points. On the menu tomorrow night – the Warm and Roasted Winter Salad. Hopefully he will be as pleased! Thank you! Just made these falafels with the lightened up lemon tahini dressing. They are delicious! This recipe sounds really yummy. I love Mediterranean food! One question, how can make this recipe gluten free. I have lately been diagnosed gluten intolerant and having so much trouble finding recipes. Thanks for this recipe and your work in general! It’s been a long time since I found a new recipe to add to my rotation and this will definitely be in it! It surprised me how tasty they were.I kind of lazied it up by using bottled lemon juice (less than called for) and just dried parsley (didn’t have fresh herbs on hand). But it was so fast and easy and it tasted great. I used canned chickpeas and did use the food processor but put them in with the red onion and just pulsed a few times until chopped/combined. They fell apart a little bit so I think next time I’ll add a little water to replace the lemon juice I left out due to using bottled. Also love the idea of putting it over salad, which is what I did. Had mushroom couscous on the side and it made a lovely weeknight meal. Thanks again! Hey! Just wondering if canned (drained) chickpeas would work in this recipe?? I came across your beautiful website this past week in my attempt to find some vegan recipes for my son. I was struck by your photography. I enjoy capturing images, but truly love looking at great photography. I have been looking at your website for a few days now, and looking for a blog relating to your journey as a photographer, and this is the only one I have found. I would really enjoy reading more about your experiences and your knowledge on photography. Do you have another place on your site that you talk about just taking pictures. Your website is so inspiring and my son has tagged a number of recipes that I will be trying out. Thank you for sharing your wealth and love of cooking and photography with us. these falafels had a wonderful taste!! I would make them again, they are pretty easy to make if you have to right sized mixer…(big enough to mix all the ingredients in one shot). Definitely worth making a nice sauce with them so that it’s not too dry… I made the peppered hummus but next time i’ll probably make the lemon tahini sauce as well! Have you tried these in the oven? Thanks for this tasty recipe! Hi Doreen, It’s great to hear you enjoyed them! I haven’t tried these particular falafels in the oven myself—if you give it a try, I’d love to hear how it goes—but in my first cookbook, I do share a recipe for Oil-Free Baked Falafel Bites that you might be interested in, too. The first time I tried this recipe, it was perfect. However the subsequent two times I’ve used your exact measurements as directed, and the falafel comes out tasting so astringent it’s unpalatable, beyond fixing, and I’ve had to throw the whole batch out. I’m really open to anywhere you might see I’m going wrong. I loved how these were the first time, and am beyond disappointed with how this keeps turning out. Hi Gale, How strange! I’m so sorry to hear that. My guess is that it might be the fresh herbs? Maybe try cutting them back a little. Or it could be ground flax gone bad/rancid. 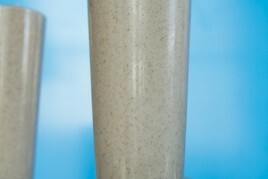 Flax has a very strong flavour even when fresh, so that could be what you’re detecting? Please let us know how it goes if you try it again! Can I use almond flour in replacement of bread crumbs? Your recipes are AMAZING!! So far I’ve made the Caulipower Alfredo pasta and tonight I made the falafels–this was my first time making and eating it loll. Everyone had seconds of both dishes :D.
Perfect recipe. Balance of spices and texture are PERFECT. Made them in the oven and was just as good fried I think!